Geo-fencing and geo-targeting are two of the buzziest marketing concepts in the retail world. Essentially, geo-fencing involves pinpointing users when they enter a specific pre-defined area, while geo-targeting targets users based on their geographic location. Retailers who combine both tools are reaping tremendous rewards. Geo-targeting can allow them to send a message to a customer regarding a store sale, driving in foot traffic. Once they’ve entered the store, retailers can then use geo-fencing to send the customer another message about a discount they can unlock by making a purchase in a specific department. Beacons are perhaps the most popular retail technology to utilize geo-location technology, with adopters including big box retailers Macy’s, Target, Lord & Taylor and, most recently, Rite Aid. Beacons work by using a phone’s built-in bluetooth technology to determine a person’s proximity – with extreme precision – to a specific location in a store. Beacons track the customer’s in-store whereabouts and communicate department-specific promotions and offers through a mobile app that the customer must have downloaded in order to receive its notifications. With 3.9 million beacons shipped globally in 2015, the nascent technology is on a fast track to becoming mainstream. Retailer American Eagle Outfitters also turned to geo-fencing to increase revenue in its factory outlets. They targeted mobile shoppers, who had previously downloaded the American Eagle app, as soon as they entered a factory mall parking lot! This targeted campaign increased sales by threefold, demonstrating the importance of incorporating mobile in order to drive foot traffic and sales. At ChargeItSpot, we also embrace geo-targeting through our mobile app. The ChargeItSpot app alerts users when their phone’s battery is running low and points them to the nearest free charge (if they have their location services turned on). This service helps us drive foot traffic to our retail partners, like Neiman Marcus, Nordstrom and Bloomingdale’s. Retailers that have the advantage of savvy sales associates can then offer these new leads a more customized shopping experience to enhance sales and loyalty. 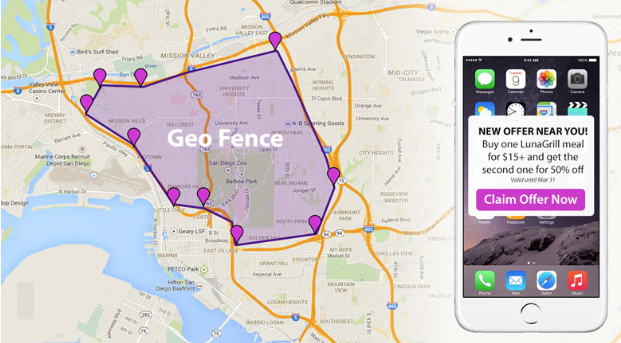 A further subset of geo-fencing is geo-conquesting which involves marketing to a customer who is near a competitor’s space. In 2013, Outback Steakhouse successfully leveraged geo-conquesting to drive diners away from competitors and into their restaurants. A geo-fence was activated in a 10-mile radius of its casual dining competitors and a 5-mile radius of its own locations. Upon entering the region, the potential customer would see a display ad in an app with an active location service (eg. a weather app). The ad would remind the consumer of Outback specials and other promotions and the click-through with direct them to a landing page with directions to the nearest Outback location. The campaign reported an 11% increase in conversions (measured not only by clicks but by post-click activity and in-store traffic increases). Traditional brick-and-mortar retailers should thus leverage location-based geo-marketing tactics – like geo-fencing and beacons – in order to drive consumers in store and fight back against showrooming and the other threats of e-commerce.